Azar restaurant is located in Gueliz area. 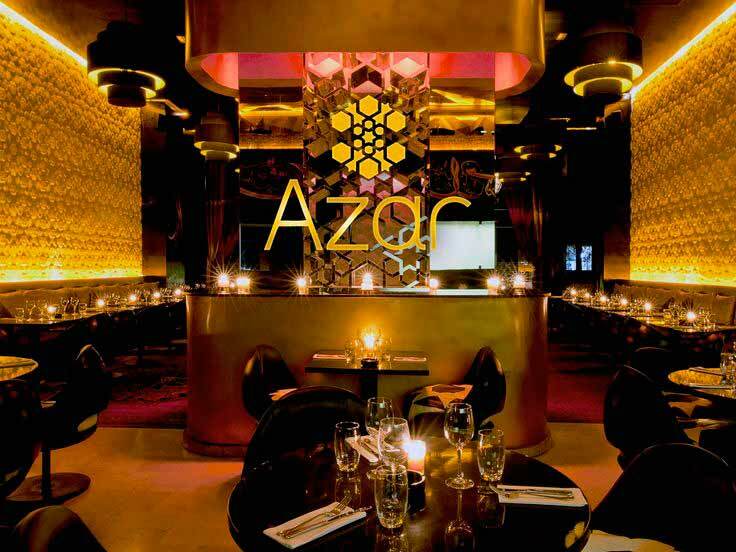 Have Moroccan and Libannes cuisine in a trendy atmosphere. Belly dancing shows an life music on weekends. You can smoke Shisha on the table. Atmosphere interior reminded us Hotel Costes restaurant in Paris. We don’t like belly dancers- so were very happy not to have that performance around…. Food was good, prices were reasonable for the quality served. Service was very professional. We would go back to Azar restaurant again. My friends and I had dinner one night at this restaurant and all the disches we’ve served were excellent prepared and presented. The staff was nice and provided very good service. Also, the dancers and the musician contributed in creating a great atmosphere. Stunning end to our holiday. We made a reservation initially for 8pm. When we got to the restaurant at 7 we asked if we could smoke shisha and have a few pre-drinks before our meal. We were led up a marble staircase lit by candles on every 2-3 steps to guide us. On the mezzanine level there was a small bar and about 10-12 seating areas each with their own shisha on the table. We ended up asking to push back our reservation to 9pm which the staff were happy to oblige to. I am so glad we did this, the atmosphere was beautiful and warm, with dim lights and candles on every table. When we were down at for our meal, we opted for the set menu for two. This included chefs choice of 9 meze both hot and cold, a choice of mixed grill or two tagines foe two and a trio of Moroccan sweets and pannacotta (which was sublime). We also ordered the lamb shawrama to come with our meze. The food was delicious, so filling and you could taste the quality of the meat which was gorgeous. After starters there was some live entertainment of two belly dancers which we were told was on every Friday and Saturday. Fantastic dancers, they got random people up and dancing with them. Definitely ended our holiday on a high.